Dezeen is giving away five copies of a map that pinpoints Chicago's concrete buildings, including iconic brutalist structures and university projects, in this competition. This competition is now closed. Congratulations to the winners, which are Kinga Bartha from Brasov, Romania, Thomas Haller from Minneapolis, US, Greg McNeil from Richmond, Australia, Iara Silva from Homerton, UK and Marco Cotugno from Moncalieri, Italy. 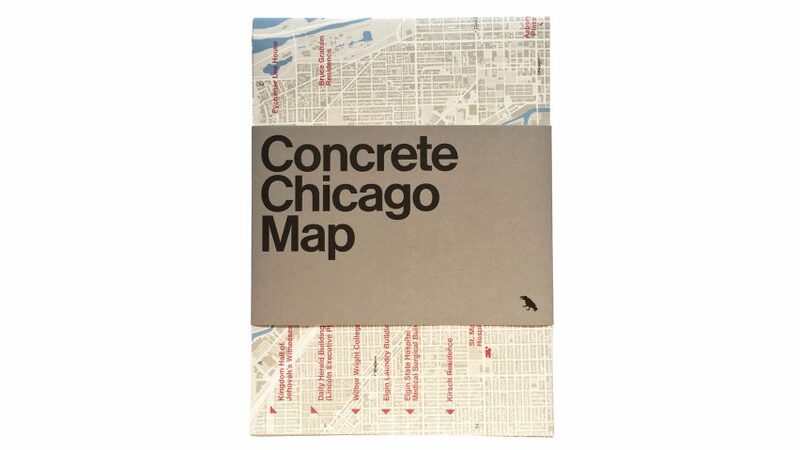 Concrete Chicago Map is a double-sided guide that details of over 50 concrete buildings and structures in the city's Downtown and surrounding areas. The foldout design has a map on one side marking the locations of the key building, which are then depicted in a series of black-and-white photographs on the reverse. Accompanying information includes the project architect and the date each was built. Chicago-based architect Iker Gil of Mas Studio edited the guide, and provided an introduction, with photography by Jason Woods. Among the projects included are the cylindrical towers of Marina City with scalloped terraces, completed by local architect Bertrand Goldberg, and the brutalist main library at Northwestern University by Skidmore, Owings & Merrill (SOM). Other buildings on the map by SOM include the cube-like structures that form the Behavioral Science Building at the University of Illinois Chicago, and the University of Chicago's brutalist Joseph Regenstein Library, where the reading room was recently updated by Tinucci Architects. The St Mary of Nazareth Hospital by Perkins+Will and the Henry Hinds Lab at the University of Chicago by I W Colburn also feature. Independent map publisher Blue Crow Media produced the guide, which ranges from Chicago's landmarks to rare and sometimes undocumented architectural finds. Concrete Chicago Map is Blue Crow Media's 12th architecture map, following a version with 40 examples brutalist architecture in Washington DC and a London guide outlining Art Deco projects around the city. Five readers will each win one print of Concrete Chicago Map, which is also available to purchase from Blue Crow Media for $11.14 (£8). Competition closes 25 May 2018. The winners will be selected at random and notified by email, and their names will be published at the top of this page.